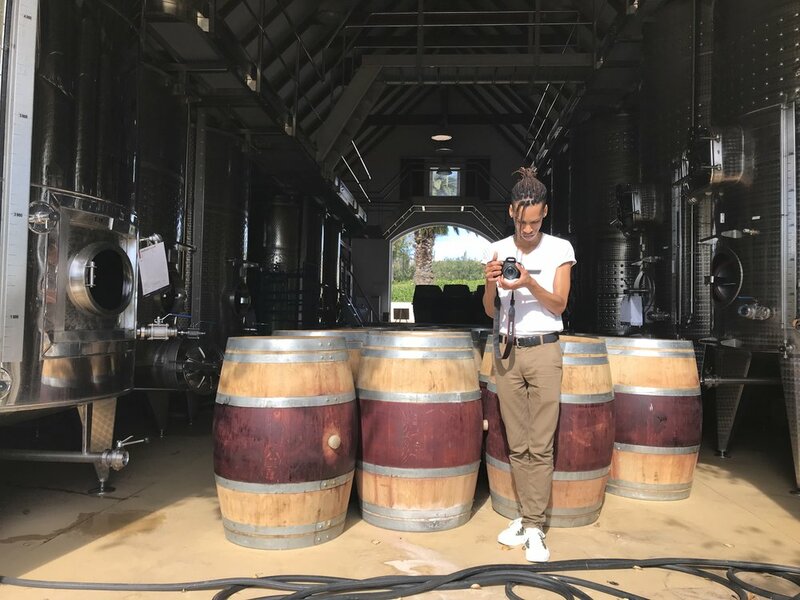 “Wine flies when you are having fun”, and fun, breathing taking landscapes and great hospitality is what you’ll experience at Peter Falke Wines. Permit me to take you through an afternoon at one of my favourite wineries in South Africa, if not the world. Nestled in the heart of Stellenbosch, it’s an estate surrounded by picturesque mountain slopes, lush verdant grounds filled with rose gardens and sculptures (including one of a giraffe). You’ll also find six friendly dogs that stroll the grounds and are more than happy to make new friends. When I first visited South Africa, back in January 2014, I knew little to nothing of Stellenbosch, except that it boasts some amazing landscapes and hundreds of wineries. I happened to tag along with some new friends(See below picture of us) from the hostel I was staying at. Julia (German), Jess (Belgian) and Aj. (American) Among the three wineries we visited that day, only Peter Falke made a lasting imprint. Not saying that the other two (honestly cannot recall their names) are not worth going to, but Peter Falke is a gem, and it did not disappoint the second time around. February 2014. New friends, wine and amazing views! Upon entering, my friend Ashley and I were greeted by one of the staff members, Tawanda, who went over the tasting and dining options, and then led us out to the outdoor area. It’s here you’ll find a patio with colourful décor; rose printed throw pillows, comfortable couches, and roses on every table. I now realize that one of the things that must have made this winery memorable, was the abundance of roses and other flowers at the grounds, and as someone who loves flowers, this estate is a floral heaven. After deciding on what to order, you’ll be left to stroll the grounds at your leisure. Head to the back of the lawn and you’ll encounter a portion of their vineyards that you can browse through. Or take a right from the patio, and you’ll pass by their open distillery room. The oak aroma from the wine barrels and stainless steel tanks will draw you in. It’s worth taking a quick peek. End your exploration of the grounds with a slow walk through their rose gardens that will make you wish you had a green thumb. The views of Stellenbosch Mountain, to the left of the gardens, will no doubt leave you in awe. Stare a while, and get lost in the slow-moving clouds. As you’re enjoying the lush good life views, you might feel something furry brush your legs. Have no fear though; it’s probably one of the six dogs that roam that property. Among them are Golden Retrievers and German Sheppard’s that after inspecting you, and getting petted, will go about their business, find some shade and get back to the important things in life, like napping. By now you’re probably feeling a bit parched, and could use a refreshing sip of a Sauvignon Blanc or a Ruby Blend. Laughs after a sip of their Ruby Blend wine. So head back to the patio area, where your server, ours was T, a native of Zimbabwe, will be waiting with your first glass. With the tasting menu, you are offered a choice of six wines, and depending on what’s in stock, you’ll be offered a variety of reds and whites. Our tasting consisted of five reds and a white. We also ordered a cheese platter, where you’ll select three of six options, and it comes with soft bread, butter, jams, and fruits. We were topped off with a sweet and delightful Muscat d’Alexandrie, from their Signature Range. Its light and fruity flavour is the perfect drink to get your palate ready for the next winery on your Stellenbosch tour! The patio, where the wine tasting can be enjoyed. The lawn area is only for bottled service and other foods. I hope you’ve been encouraged to visit Stellenbosch on your trip to Cape Town, and hopefully, you’ll add this favourite of mine to your wine tour. Peter Falke is sure to be as memorable to you as it is to me. Cheers to great wine, and amazing scenery. Come back in a few weeks for another insider look at a second estate in Stellenbosch that will be sure to wow your wine wanderlust. - Expect to spend about $25-40USD/Euro, at Peter Falke, depending on what you order. This ranges from the tastings, cheese platters, ordering bottles and other food. Example: I did the wine tasting, which is R65 per person, and the cheese platter R195, so total is R325. Works out to be about 25USD, and around 21 Euro. - Expect a 30-40 minute drive from Capetown, traffic depending. It’s a scenic drive to and in and around Stellenbosch, so take your time and enjoy the landscape. - Map out the wineries you want to go to. The closer they are to each other, the more time you have for wine and relaxation!